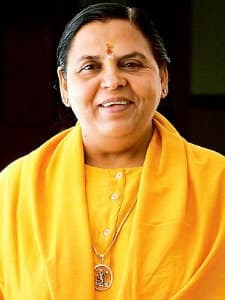 Uma Bharti is an Indian politician and the current Union Minister for Water resources, river development and Ganga rejuvenation in the Government of India. 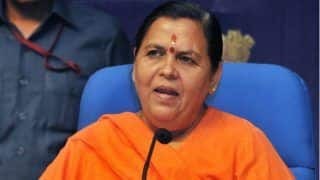 She is a member of the Bharatiya Janata Party (BJP) and a former Chief Minister of Madhya Pradesh and has held various state and national level portfolios in the Ministry of Human Resource Development, Tourism, Youth Affairs and sports and coal and mines. 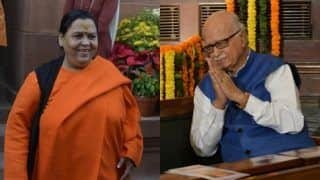 Addressed as Sadhvi, a respectful Sanskrit title for female renunciant, Bharti is known for her involvement in the Ram Janmabhoomi movement and the demolition of Babri Masjid. 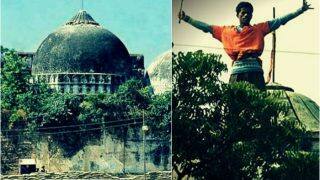 She also has strong relations with Rashtriya Swayamsevak Sangh (RSS) and she follows the ideology of the Sangh. 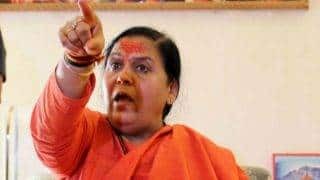 Born on 3rd May 1959 in Tikamgarh, Madhya Pradesh in a religious Lodhi family, Uma Bharti was born to a family of peasants. She attended the school up to the sixth standard and as a child, she was deeply influenced as well as interested in religious texts like Bhagwad Geeta and she started to give religious discourses while she was still a child. 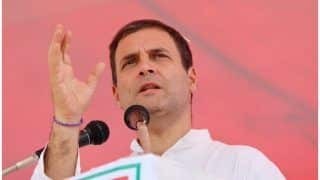 She then came in contact with Rajmata Vijayraje Scindia who later became her political mentor. Her mentor Rajmata Vijayraje Scindia introduced her to BJP when she was in her early twenties. She contested the Lok Sabha elections for the first time in 1984, the elections after Indira Gandhis assassination. She lost the election because of the Congress wave after Indira Gandhis assassination. In 1988, she was elected as the vice-president of the BJP Madhya Pradesh unit and in the 1989 Lok Sabha election, she contested the election from Khajuraho constituency and was elected to Lok Sabha for the first time. As a Member of Parliament, she became the Member of Consultative Committee and Ministry of Agriculture. From 1991-93, she was the Member of Public Accounts Committee. She again won the 1991 Lok Sabha election from Khajuraho and retained the seat in 1996 and 1998 Lok Sabha elections. 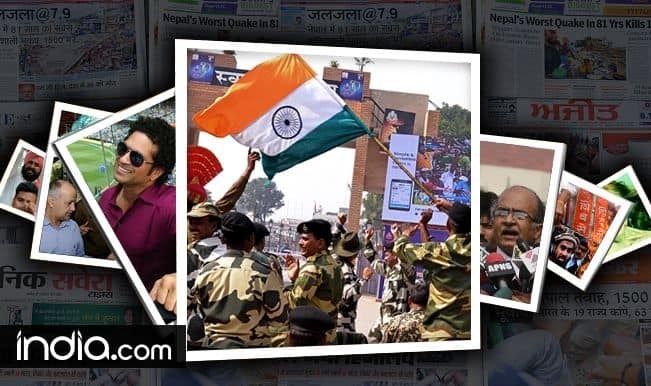 She rose to national recognition as one of the prominent faces of Ram janmabhoomi movement and her fiery speeches are considered as one of the reasons for the movement to achieve its momentum. 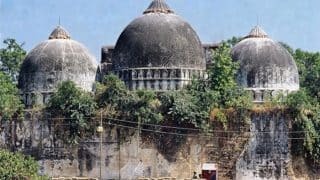 In December 1992, she was one of the faces present at a rally in Ayodhya that developed into a riot and led to demolition o the Babri Masjid. She was indicted for inciting the mob to violence but she denied that she incited the mob but she said that she does not regret it and is ready to take the moral responsibility for the demolition. In 1993, she became the President of the BJP Youth Wing. After winning the 1996 Lok Sabha election, she became a member of Committee on Science and Technology as well as Environment and Forests. After winning the 1998 elections, she became the Union Minister of State for Human Resource Development. In the 1999 Lok Sabha elections, she switched her constituency from Khajuraho to Bhopal. She won the election and became a cabinet member in the Vajpayee government and held various posts like Union Minister of state for Human Resource Development, Tourism, Youth Affairs and Sports and Coal and Mines. 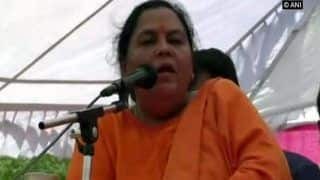 In the Madhya Pradesh state assembly elections, Bharti was appointed as the Chief Ministerial candidate of the BJP and she did a fierce campaigning for her party on the agenda of development and Hindutva and she led her party to win a three-fourth majority in the legislature. She contested from Malehra constituency and became the Member of Madhya Pradesh Legislative Assembly. 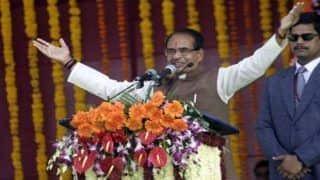 On 8th December 2003, she became the Chief Minister of Madhya Pradesh. 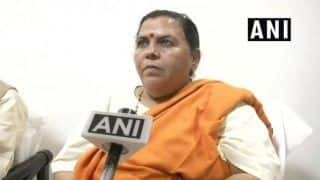 In August 2004, an arrest warrant was issued against Uma Bharti with the connection of the Hubli riots of 1994 and she was forced to resign. 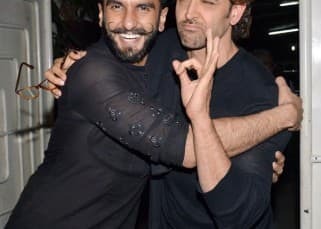 She also had a public falling out with Lal Krishna Advani and she was suspended from the party. 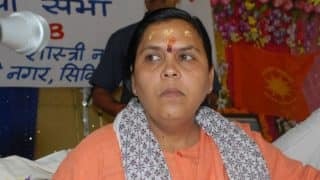 At the insistence of RSS, her suspension was revoked but after joining the party back, she again started to publicly defy BJP high command and insisted that she should replace Shivraj Singh Chauhan s the Chief Minister of the state. 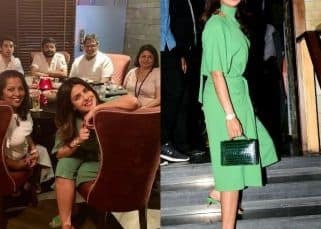 The BJP then sent several show-cause notices to her and eventually expelled her from the party. 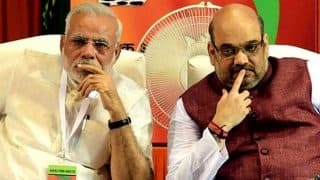 After being expelled, she created her own political party called Bharatiya Janshati Party and stated that her party followed the ideology of RSS. However her party didnt receive any political success. 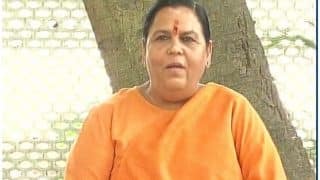 Bharti was re-inducted to BJP in 2011 and was tasked for reviving the BJP in the upcoming 2012 assembly elections of Uttar Pradesh. 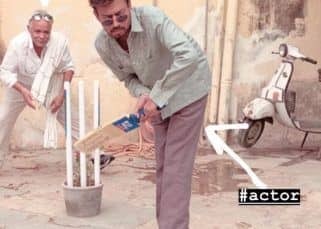 She contested the assembly elections from Charkhari constituency in Mahoba district and became a member of Uttar Pradesh Legislative Assembly. 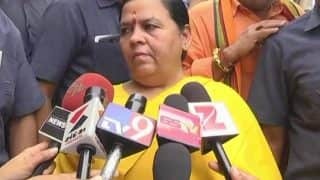 For the 2014 Lok Sabha elections, Uma Bharti along with twelve others was appointed at the position of vice president and had the responsibility to guide BJP through the 2014 Lok Sabha elections. She contested the Lok Sabha elections from Jhansi constituency and won the election by defeating Chandrapal Yadav of the Samajwadi Party. 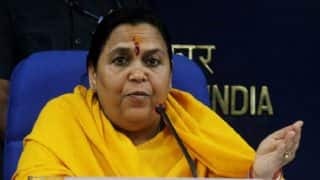 She was then appointed as the Minister for Water Resources, River Development and Ganga Rejuvenation by newly elected Prime Minister Narendra Modi on 26t May 2014. 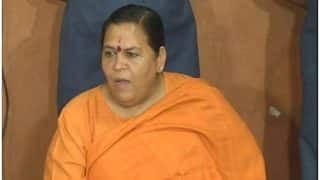 Uma Bharti is unmarried and is known for her controversial statements. 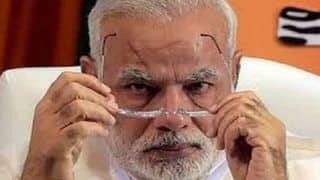 In late November 2011, after the governments decision to allow 51% Foreign Direct Investment in multi-brand retail and 100% in single brand, she threatened Walmart with arson if they tried to enter Indian market. She also holds a weekday fast in July 2007 protesting against the Sethusamudram Shipping Canal Project and stated that the bridge must be saved. Some of her publishing include Swami Vivekanand in 1972, Peace of Mind in Africa in 1978 and Manav Ek Bhakti Ka Naata in 1983.